Me, my daughter, and Hacksaw! Wow, the last few days have been amazing in terms of meeting wrestlers. Friday night, I had a one on one interview with Impact Knockouts wrestling champion Mickie James. 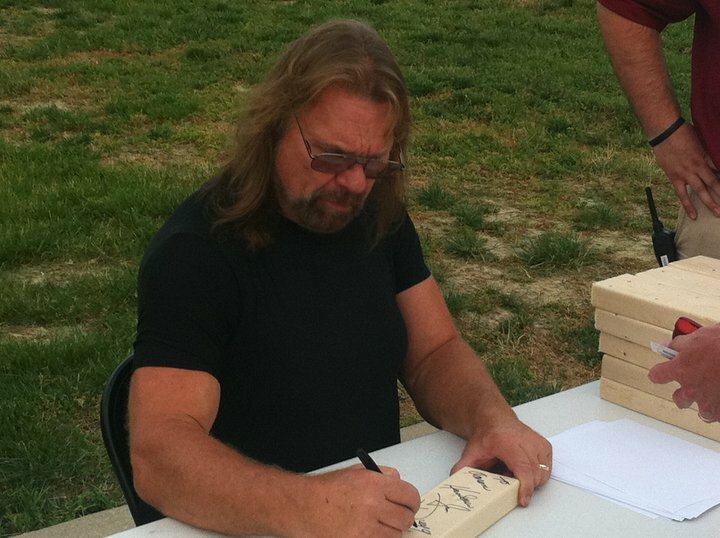 Tuesday night, I got to meet WWE Hall of Famer, Hacksaw Jim Duggan. Duggan was at Rent One Park, home of the Southern Illinois Miners, signing autographs and meeting with fans. The Miners are a member of the Frontier League in the world of baseball. Anyway, back to the point... Duggan was there as a special promotion. He signed small pieces of 2x4 for fans who bought a special ticket. They could also chose a signed 8x10 photo instead. Duggan was so down to earth with everyone. He laughed and joked. Here's the link to my One on One interview with him. Signing 2x4's at Rent One Park, tough guy! My wife was out of town at the time, so I brought my young daughter again. She met Mickie James the other night too. She was a bit intimidated by Hacksaw. He extended his hand to her and she refused to shake it. She's pretty shy anyway, then you throw a nearly 300 pound stranger bellowing at her and she got real quiet. I had to physically take her hand and make it slap 5 with Hacksaw. He's a really great guy! A couple of funny things he said while signing autographs was the Ric Flair and Hulk Hogan are the only two these days who call him "young man", everyone else calls him "old timer." I got a chuckle out of that. He also told fans he and a few other Hall of Famers would be at an upcoming SmackDown! He talks a little more about it in the video. I also asked him about his thoughts on the passing of Randy Savage. The two feuded briefly in 1989 when Savage beat Duggan and became known as the "Macho King." Duggan also shares his feelings on his induction into the WWE Hall of Fame and the highlight of his career. Check it out, and subscribe tough guy! You know the drill now, "like" us on Facebook. Follow us on Twitter. Thanks for reading and watching!